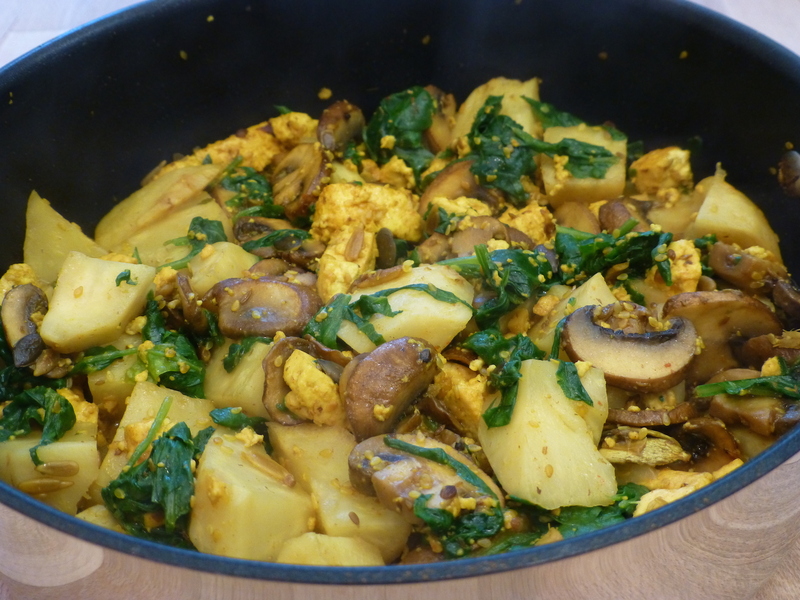 Curry of celeriac, spinach, mushrooms and paneer • Quick & Tasty - Get Cooking! Celeriac, spinach and mushrooms go together surprisingly well. Combined with fried paneer (Indian fresh cheese, available in most supermarkets) this makes a great mild curry. Wash and dice the celeriac. Cook it in the microwave at full power (900W) for 4 minutes, then stir, then cook for another 3 minutes. Add the mushrooms and fry over medium to high heat for a few minutes, until the mushrooms start to release their moisture. Clear some space in the middle of the pan and put in the soy sauce. Stir vigorously, then lower the heat. Meanwhile, add the celeriac to the pan, stir until it is well covered with the spices. Cut up the cooked spinach and add it to the pan. Stir and let simmer for a few more minutes.